Totally vegan cream cheese? Heck yeah! It’s not only possible…it’s delicious too! 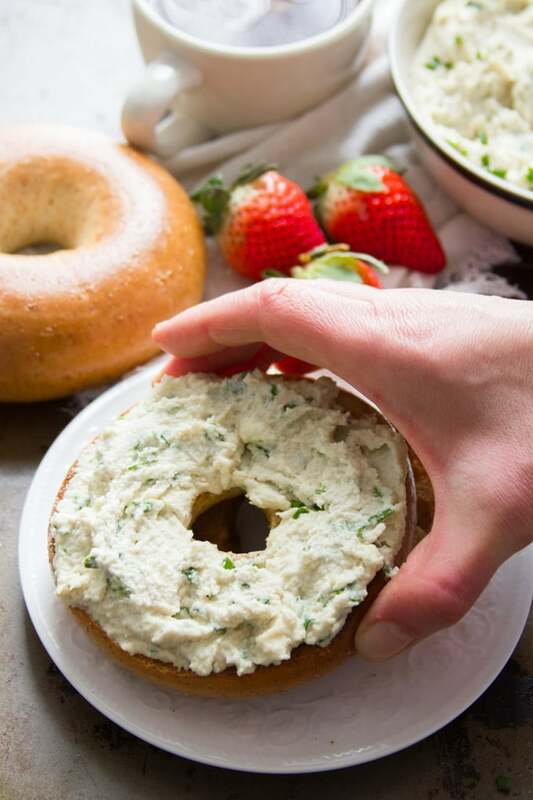 This dreamy dairy-free cashew cream cheese will make you a believer! There was a time when nothing made me happier than a big toasted everything bagel slathered in cream cheese. So good! I might even take a cream cheesy bagel over ice cream. That’s how much I loved it. And then there was a time when I cut out dairy and thought I’d never again be able to enjoy a bagel slathered in cream cheese. Such a bummer. That was all before I started stockpiling cashews in my kitchen. Because, they’re pretty amazing when it comes to making vegan versions of all things dairy (cheese balls, cheesecakes, creamy sauces, and everything in between). So that’s what I used when I decided to try whipping up some vegan cream cheese. It worked out great! Cashew cream cheese is delicious. It was way easier to make than I’d even imagined, it tasted just as good on a bagel as the dairy-based cream cheese I used to love, and it only requires three ingredients. Plus maybe water, and any stir-ins you like! 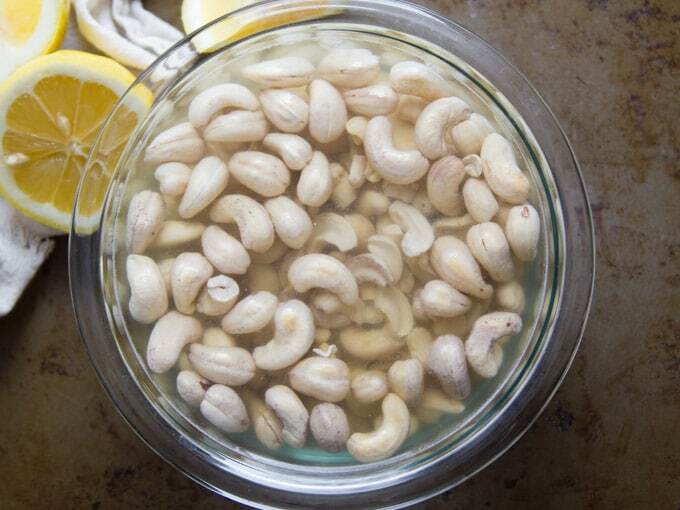 You start by soaking some raw cashews. This softens them so they blend up nicely. 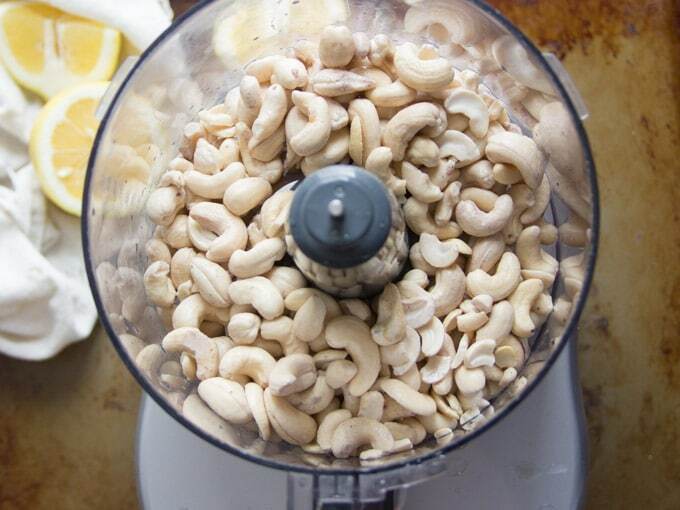 Transfer your soaked cashews to the food processor, and add lemon juice and salt. Blend until creamy! You can recreate your favorite cream cheese flavor by including some stir-ins. My favorite cream cheese flavor was always chive, so that’s what I used, but feel free to get creative. Slather it on a bagel (or crackers, or veggies…whatever floats your boat) and enjoy. Be patient when blending! It can take a while, especially if you don’t have a high-powered blending device. But it’s totally doable! In other recipes that use cashews in place of dairy I might suggest boiling the cashews if you don’t have time to soak them. I don’t recommend that here. Boiled cashews don’t blend up quite as smooth as soaked, and since this cheese is almost all cashews, the texture will be noticeable. I’ve had a lot of people ask me if cashew cream cheese can be substituted for dairy-based cream cheese in cheesecake recipes. The answer is maybe, but I wouldn’t risk it. You’re better off just following a recipe for vegan cheesecake. I’ve got a plenty of those here. Unless you’re using a small blending device, I don’t recommend cutting down on the batch size. You might not be able to get it all to blend. This stuff is freezer friendly! Stick it in a sealable storage container and freeze it for up to 2 months. Totally vegan cream cheese? Heck yeah! It's not only possible...it's delicious too! 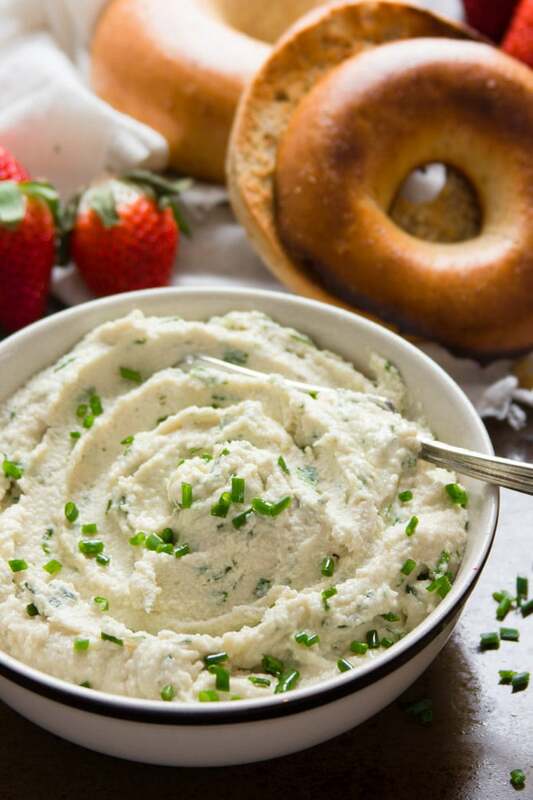 This dreamy cashew cream cheese will make you a believer! Place the cashews, 1 tablespoon of lemon juice, and salt into the bowl of a food processor. Blend until smooth, stopping to scrape down the sides of the bowl as needed. Add a tablespoon or two of water to thin the mixture as needed. Taste test and add additional salt and/or lemon juice if you like. Add any stir-ins to the food processor and pulse until finely chopped and well blended. Serve immediately or store in a sealed container in the refrigerator for up to 4 days, or freeze for up to 2 months. Oh I am so excited to try this! We have been looking for an alternative to cream cheese, Thanks!! Wonderful! Cream cheese is a tough one to give up. I think you will really enjoy this version! I love your cream cheese. I made some minor alterations though. Instead of the oil I used 1/4 cup of plain almond yogurt. I also used less lemon juice. It tastes so good that I dug out my driveway (three inches of snow overnight) and picked up some bagels at Einstein’s! Thank you! The almond yogurt variation sounds very interesting – I never even thought about using yogurt. I bet it makes it really nice and creamy. I’ll have to keep that in mind for next time! Did i miss oil in the recipe? My point here, I guess, is I’m wondering whether you think the long soak time is critical? I’ve actually never tried any cashew cream based recipes without soaking, because every one I’ve ever come across does require soaking. I’ve also always thought that it depends on what type of food processor/blender you’re using (basic Hamilton Beech food processor here). Thanks for the link to your recipe. It sounds delicious and I’ll definitely try it out. If I can do alfredo sauce without soaking I can’t see why cream cheese wouldn’t work as well. I’ll try to post an update on my findings! I rarely soak my cashews for recipes with no issues, but that being said I have a Cuisinart food processor and a Cleanblend (Vitamix look-a-like) blender. I can’t wait to try this cream cheese recipe. I miss cream cheese and cheat occasionally because I love it so much and my neighborhood store is often out of the Better Than Cream Cheese. Let’s not forget how expensive those little tubs are. Yeah, it really depends on the blending device! I might be able to get away without soaking using my Cuisinart, but not with my cheaper mini food processor. :) I hope you enjoy this! Soaking softens them, making them easier to process. I’ve read that boiling them for an hour will have the same result as overnight soaking. Boiling them will kill all the beneficial enzymes and lots of nutrients we may not even know about. Soak those nuts! Thanks — just found your blog today and looking forward to going back through the archives! Hi Annie! The longest I’ve kept this around is about four days and it held up just fine. I’d have to guess and say about one week max, based on my experience with the shelf life of cashew milk. If you’re unsure I think the smell test should tell you if it’s still good, as this is always a good indication with nut milks. Thanks so much for checking out the blog – hope you enjoy everything!! I saved some in the fridge for two weeks…still delicious. Yay!! Glad it held up and glad to hear you enjoyed it! You can easily find recipes for raw vegan onion bread (which is easier with a dehydrator, but can be done in the oven). 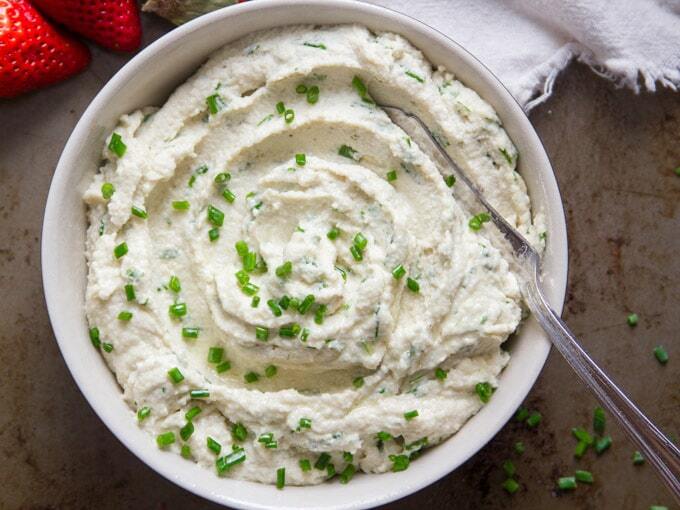 It’s wonderful (and healthy) with cashew cream cheese! Gorgeous! Nothing gets me going more than a big vat of creamy cashew cheese. It almost seems like there’s nothing that cashews can’t do! Thank you!!! And totally agreed – cashews have quickly become one of my favorite ingredients to play around in the kitchen with! I cannot eat canola oil..can olive or grape seed oil be used instead? Absolutely! I picked canola because of its accessibility and neutral flavor, but you could sub lots of different oils in this recipe. In your case I’d say grape seed is probably the better choice because the flavor is milder than olive. Indeed, soaking is actually critical to all nuts AND beans. They each contain an enzyme inhibitor (which orevents them from sprouting in less than ideal growing environments). This enzyme inhibitor is known to cause intestinal leakage (“leaky gut” syndrome) which leads to symptoms such as gas and cramps . And inhibits some nutrient absorption. If u luv beans/nuts and not the gas/cramps … soak them overnight THEN cook or redry (the nuts redry) and see the difference). Can you leave the oil out all together? You could, but before I added the oil it was a bit thick and grainy for my taste. I’d say give it a shot without the oil, see what you think, and then add the oil if you think it needs some thinning/smoothing out. You can grind the cashews in a seed/coffee grinder then blend with your liquid. That way you don’t have to soak before hand. You can use olive oil, but if you are trying to avoid the olive oil flavor, I recommend walnut oil or avocado oil. You may want to do more research on grape seed oil can lead to inflammation due to the ratio of omegas. In the past, I experienced inflammation with grape seed oil first hand and it was not pretty. :0 For cashew creams (to make cream based soups), you don’t need to add oil at all. Also, I recommend soaking nuts for health reasons. Some blenders can easily hands unsoaked nuts, but we soak them for the health benefits. I’m tryibg to find unexpensive, common ingredients I can find in a market around the world, the more unprocessed the better. – Why canola and not olive oil? – Any substitute for cashews? Almonds, palm hearts, toffu, garbanzos, other beans? – What’s the use of yeast flakes? How can we substitute it? I used canola oil because the flavor is pretty neutral. You could go with olive oil but it might change the flavor a bit. As far as the cashews are concerned, I can’t really suggest any substitutions without doing some further recipe development. Cashews work well because they have a neutral flavor and blend up nice and creamy. The nutritional yeast flakes give the recipe a cheesy flavor. Cream cheese is generally pretty mild, so I only used a tiny bit here. For that reason, you could probably get away with omitting this ingredient, but your batch might turn out a little bland. If you want to try kicking up the flavor with other ingredients maybe add a pinch or two of onion or garlic powder – totally different flavors, but still pretty tasty. Any significant deviation from the recipe is probably going to require some trial and error. Good luck if you give it a shot, and I hope my responses are helpful! This is really good, thank you so much! I’m having this on a KinnickKinnick GF bagel right now with coffee (with coconut milk) and it’s quite realistic. I haven’t had a bagel and cream cheese in so long it’s not funny. What I really like about this is it’s so quick as long as you’ve soaked the cashews. I soaked them yesterday, drained and refrigerated them overnight, then made this with my stick blender this morning. I added granulated garlic and dill, and I accidentally dumped in the nutritional yeast, but it’s still really good. I also eyeballed everything. I will definitely make this again. I used about a tsp of ghee instead of canola oil, btw. Thank you so much for sharing your results! Garlic and dill sounds like a delicious way to flavor this – I’m going to have to remember that for next time. Good to know that ghee works as well, as I’ve had a few people asking about substitutions for the canola oil. So glad you enjoyed this! Keep in mind, if you use ghee, which is clarified butter, the recipe is no longer vegan, but still much better for you than regular cream cheese. Absolutely – and thank you for pointing that out! Probably a good substitute for non-vegans just looking to cut back on dairy. I am so excited to find this substitute for dairy cream cheese because my husband has developed allergies to all dairy and eggs so it really had decreased our food options! I’m sorry to hear about your husband’s allergies but glad that this recipe can be of some help! I hope you both enjoy it!! Thank you, and I’m sorry to hear that you’re allergic! I’m planning on doing lots more experimentation with vegan cheeses and will definitely post if I’m able to come up with a recipe using something other than cashews! Is there a vegan form of ghee? I recently made something similar and it was exceptional. Unlike dairy products this is hearty and fulfilling. It was made with basic ingredients including garlic, lemon juice, sea salt and some black pepper. Came out wonderfully. Yes! I love how satisfying this is, without being heavy like dairy! This sounds great as a spread, but can you bake with it, as in a cheesecake recipe? Will have to soak 2x the cashews next time and give this another try. Thanks for posting! Hi Shelly! Thank you! I’ve been using the food processor function of a Ninja to make this, and the bowl is rather small so I didn’t even think of that being a problem. I appreciate your feedback and I just updated the post to include a note on batch size, so hopefully this doesn’t happen to anyone else. Thanks again! Yay! You’re welcome and I’m so glad to hear you enjoyed it! Thanks for sharing your results – the two hour soak time is good to know. I’ve had a few people comment/ask about shorter soak times but I’ve yet to do any experimenting with it myself. I have been making the sun dried tomato/basil cream cheese from Miyoko Schinner’s book: Artisan vegan cheese. The last time I made it, I added some finely chopped black olives which were a hit! Today I will be making another version of this since her recipe calls for rejuvelac and I don’t feel like waiting several days for the grains to sprout and then for the liquid to ferment. I love the rejuvelac cheeses too, but yes, they can be time consuming. I hope you enjoy your take on this recipe! just made this for a dinner party. Using it for the filling in spinach and cheese puff pastry roll ups. Will sprinkle the top with vegan Parmesan. It is delicious. My husband taste tested it and loved this. Thanks! Thanks Anne! I’m glad you like it – and puff pastry roll ups sound like an awesome use for this! I’ve been collecting recipes for homemade seed/nut crackers, and found a bunch on Pinterest AND on http://www.rebootwithjoe.com (Reboot With Joe — Joe Cross’s website mainly dealing with juice fasting for health, cleansing, and eating right for health). Crackers and cream cheese are two of my favorite things, so I will be trying this recipe as soon as I get home today. I’ve also found the recipes on Pinterest for things like cauliflower tortillas and pizza crust are really good. In fact I made a pizza and used Kefir cream cheese as the foundation of my toppings. The recipe titled Cheesy Cauliflower Breadsticks is especially yummy. Give it a shot! Thanks for sharing! I’ve made this several times now and it is is stellar! I add some minced onion for some batches and sometimes roasted red peppers. I’m going to try sundried tomatoes next time. I absolutely adore this stuff – it’s like creamy cashew crack! Thank you so much! I just found your blog and was thrilled with your cream cheese recipe. I have one question for you, do you think I could use this recipe of cream cheese to make and bake a cheesecake. This looks great! What food processor would you recommend? Thank you! For small batch stuff like this I like the Ninja. It’s pretty cheap, powerful, and small so everything gets well mixed. As I have made double portion I used chilli and coriander in one half and spring onion with a bit of sweet paprika in other. That helped to mask the lemony overtake a bit. I loved it on some dehydrated crackers I made the other evening. Thank you again for this and all other amazing recipes on your site. Ah! The amount of lemon is definitely a taste thing. The spices sound like a good call! :) One other thing you could do is soak up some more cashews and blend them in – and if you end up with a huge batch you can stick some in the freezer! this is the best dairy free cream cheese I’ve tasted and ever made! Going on my homemade honey whole wheat bagel tomorrow morning! Thank you so much for the recipe! Glad to hear it! Thank you so much Sara! I am excited to make this tomorrow with the smoky portobellos! I make and love a lot of your recipes, and I have a kind of general question for you. Do you always use freshly squeezed lemon juice or do you get a jar of it? Lemons have been crazy expensive around me lately and I wonder if you think the taste will suffer too much if I use the jar of lemon juice. I found a nice bottle of it, cold pressed organic, not from concentrate. Thanks as always for sharing your wonderful food and ideas. I usually go with fresh lemon juice, but I think jarred or bottled would be just fine. Every now and then I use bottled lime juice because my supermarket doesn’t always have the best limes, and I’ve never had a problem. :) I hope you enjoy the sandwiches! Thanks Cori! Made this just before Christmas (used bottled lemon juice, btw) and added dill, garlic, etc., and it was a huge, huge hit, with omnivores and vegans alike! Just made another batch today, plain, no extra flavours. Beautiful just as it is, and super simple to make. Thank you so much, keep the easy, delicious recipes coming! Just finished making this, and it tastes pretty good! I did less lemon juice and more oil (olive). I thought it tasted a bit pasty so I also added a couple tablespoons of oat milk to thin it out. I then added oregano, onion powder, and garlic powder! Looking forward to eating some veggies with this! Those sound like delicious additions! Glad you’re enjoying it! Yay! Glad you’re enjoying it! I am looking at this to replace a cream cheese filling in baking. Would you recommend using it as the filter itself or directly substituting it for the cream cheese? I have made cashew cheesecake before, although it used maple and vanilla to sweeten it. But I’m not sure about adding the eggs in with it. I avoid milk due to a good allergy, but can still eat eggs. Hmmm…I haven’t used this in cheesecake and I don’t cook with eggs so I’m really not sure how to go about it or if it would even work at all! Sorry! I do have a bunch of vegan cheesecake recipes on this site that you could try (this is a favorite: https://www.connoisseurusveg.com/caramel-apple-vegan-no-bake-cheesecake/). I avoid Dairy, Oils and Processed foods. What do you think would be a good Oil Replacer? So,this looks really good and easy, but I am confused. I have seen comments about omitting the oil, but I don’t see oil in the recipe or video. Am I missing something? I recently revised this post and simplified the recipe, so the oil is no longer included. I’m so glad you enjoyed it! 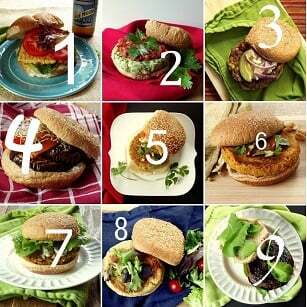 Hi Alissa, I made this recipe last year and absolutely loved it! Recently, I started to get a craving for this cream cheese again but saw the recipe is not the same as before! Is there a possibility that you still have the old recipe as I loved it so much and I don’t seem to get the consistency and taste right on this new one..
New to this site & due to cholesterol issues am trying to go to a vegan diet. Is there recipes such as spanakopita, pasta dishes… using the cashew cream cheese? I have made a few different recipes for cashew cream cheez. This is the best one I’ve found! And so simple! I blended in some sun dried tomatoes and basil. Yum! Yay!! I’m so happy to hear that!! Thanks Tina! Can I use a Vitamix blender to make the cream cheese versus a food processor? Thank you! I use a Cuisinart 11 cup food processor, and I’ve also used a Hamilton Beech (I think it was the 8 or 10 cup, and the cheapest one you can buy), both with good results! This is so tasty! I added red onions, chives and sun dried tomatoes. Lunch just got much better. I’ll have it on toast topped with roasted tomato slices. Sounds delicious! Glad you’re enjoying it! I have a question about raw cashews. I’ve been told they are toxic in their raw form, with the same toxin found in poison ivy. Being HIGHLY allergic to poison ivy, and having just gone to whole foods/plant based, I’m still experimenting with vegan recipes. I’ve ordered raw cashews, but now I’m afraid to try them. I’ve seen where raw are actually steamed, but I’m curious as to whether others have reactions to them. I had to order from Amazon and I can’t find whether my particular brand of cashews have been “lightly” processed or not. I drink cashew milk with no issues. Help! I don’t want to make myself sick this weekend trying new recipes! In place of cream cheese in a soup? I’ve never used it in a soup, but I don’t see why not! Hi can I add lime juice instead of lemon? Does it change the flavour much? It probably will change the flavor a bit, but I think it’ll still taste good! Thanks! I added lime but you’re right the flavour changed. It was too tangy. I’ll try with a lemon this time.